Went apple picking? Got lots of apples? 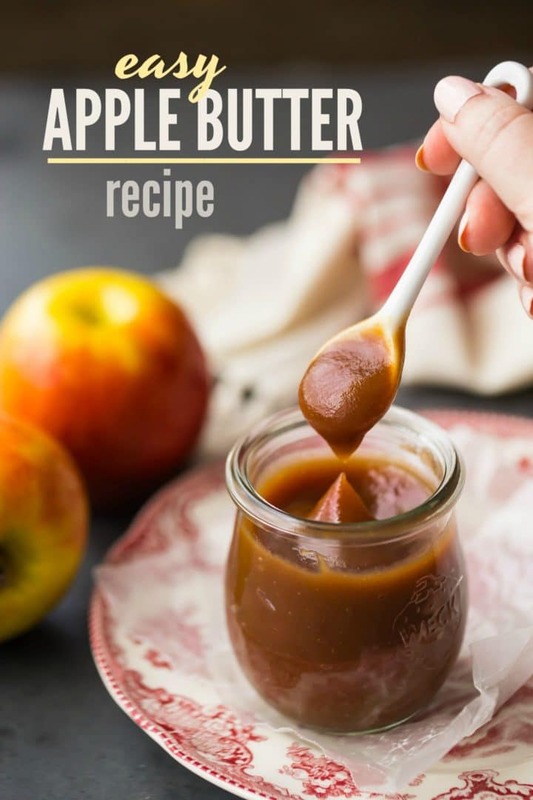 Make this easy homemade apple butter recipe! Just a few simple ingredients and so much delicious fall flavor! Nothing screams “Fall!” like big pot of homemade apple butter, bubbling away on the stovetop! It’s just bursting with sweet apple and warm spice flavors, and it’s got tons of great uses. We love to enjoy it simply spread on toasted cinnamon bread, scones, or biscuits, but the possibilities are truly limitless! 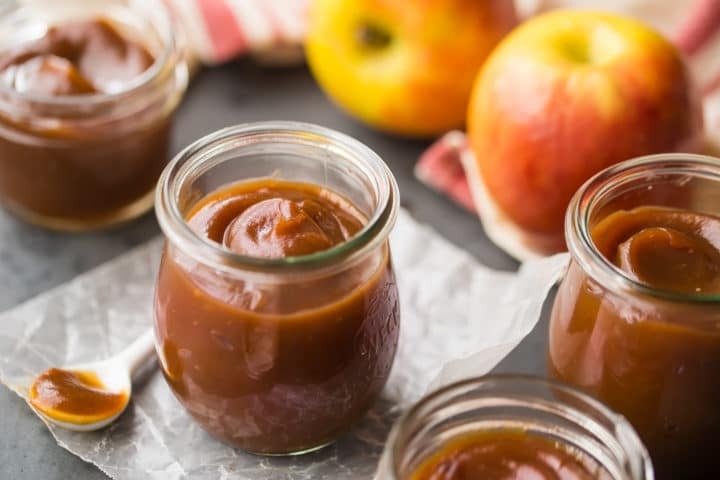 Anything that wants a little sweet fall flavor will taste delicious with a dollop of homemade apple butter. And you won’t believe how easy it is to make your own apple butter from scratch. It only takes a few basic ingredients, and most of time it’s completely hands off. I’ve got instructions here for making homemade apple butter on the stovetop OR in the crockpot. It’s totally up to you! Either way you will love this sweet fall treat. 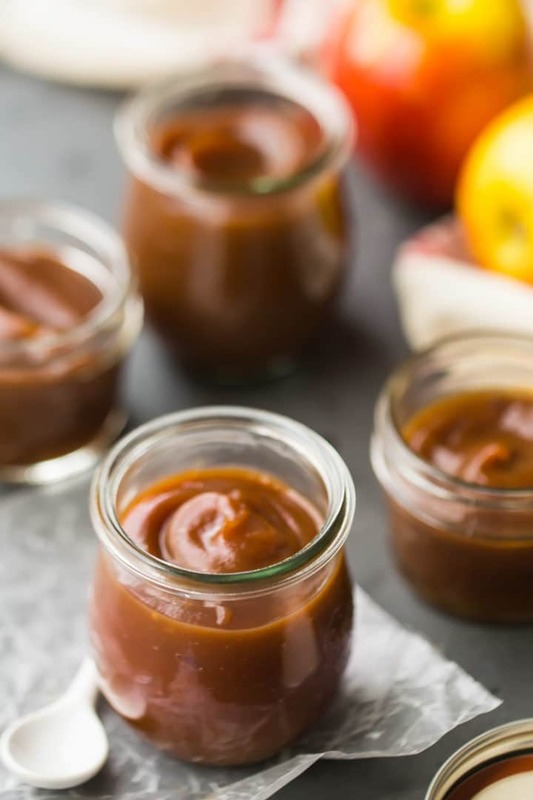 Apple butter is a simple, home-y topping that tastes great spread on biscuits, scones, or toast. It’s made from primarily from apples, but it doesn’t actually contain any butter or dairy of any kind. In fact, it’s vegan! Apple butter has a hint of warm cinnamon spice, but mostly it just tastes like apples. It’s a very intense apple flavor, because it is essentially just apples cooked down and concentrated to their essence. It’s in a class by itself. It’s not really a jam or a jelly, although it can be used in much the same way. And it is not quite the same thing as applesauce either. It’s thicker, smoother, and has a more concentrated apple flavor. You can make this recipe from just a handful of basic ingredients. Start with a whole lotta apples! You’re going to want about 4 pounds of apples for this recipe, which is approximately 9 medium-sized apples. If you’ve just gone apple picking, this is a great way to use your haul! You can use any kind of apple you like for this recipe. For the batch you see in these pics and video, I chose to use Honeycrisp apples because I like their natural sweetness. You could also use Golden Delicious apples, Gala apples, or Fuji apples. Or, if you prefer a more tart apple flavor, then Granny Smith apples would be a great choice. But really any kind of apple will work, so just use what you have! To make this easy recipe, toss all your ingredients into a big pot and bring it to a simmer. Allow it to cook, stirring every now and then, until the apples have become really soft and are beginning to fall apart. For my Honeycrisp apples, this took about an hour on medium-low heat. Once the apples are really soft, the apple butter can be pureed. I like to do this with a hand blender, but you could also use a regular blender, food processor, or food mill. (If you aren’t using a hand blender, you’ll want to do this in batches so as not to overflow your machine.) Be careful- the mixture is hot and steamy! When the apple mixture is velvety-smooth, return it to your pot and let it continue to cook down. Basically you just want to let the liquid evaporate and leave behind a very concentrated apple puree. The longer you cook it, the thicker it will become. And it will thicken up even more as it cools, so keep that in mind! Once it’s reached a deep brown color, and has the consistency of a thick spread, remove it from the heat and squeeze in a little fresh lemon juice. This will really brighten up the flavor! CAN THIS APPLE BUTTER BE MADE IN A CROCKPOT? I really like this stovetop recipe, because it’s relatively quick to make. But you could also make it in a crockpot or slow cooker! To make a slow cooker apple butter, cook the apples, cider, brown sugar, and spices on high heat (uncovered) for about 2 hours (or until soft). Then, puree them just as you would for the stovetop recipe. Then lower the heat and allow the puree to cook for 8 to 10 hours. Give it a stir every now and then, just to be sure it’s not burning on the bottom of the pot. It takes a long time but your house will smell incredible, and it’s mostly hands off! WHAT IS APPLE BUTTER GOOD ON? There are SO many great uses for apple butter. It’s got a naturally sweet taste, so it works really well as a filling in desserts. But it’s also really nice on more savory dishes like herbed chicken or pork. In the Philadelphia are, where I live, we often enjoy it as a topping on scrapple. The sweet and savory contrast is incredible! Most commonly, apple butter is enjoyed as a spread on toast, biscuits, or scones, but I’ve also used it to fill cupcakes (like these Apple Cinnamon Pancake Cupcakes) and breads (like this Apple Butter Cinnamon Swirl Bread). CAN APPLE BUTTER BE CANNED? 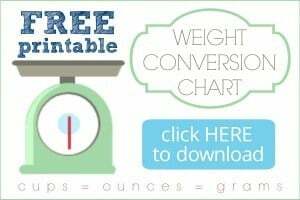 You can absolutely can this, it works fabulously! Just sterilize your jars, boil your lids until the seal is softened and gummy, and fill the jars with apple butter. Wipe the edges of the jars clean, screw on the lids, and submerge in boiling water for about 10 minutes. As the jars cool, you should hear the lids suction down and “pop.” This is how you know your seals are airtight! If done properly, the jars of apple butter can be kept for months in a cupboard at room temperature. But if you don’t feel like going to the trouble, just keep it in the fridge and you should be just fine! 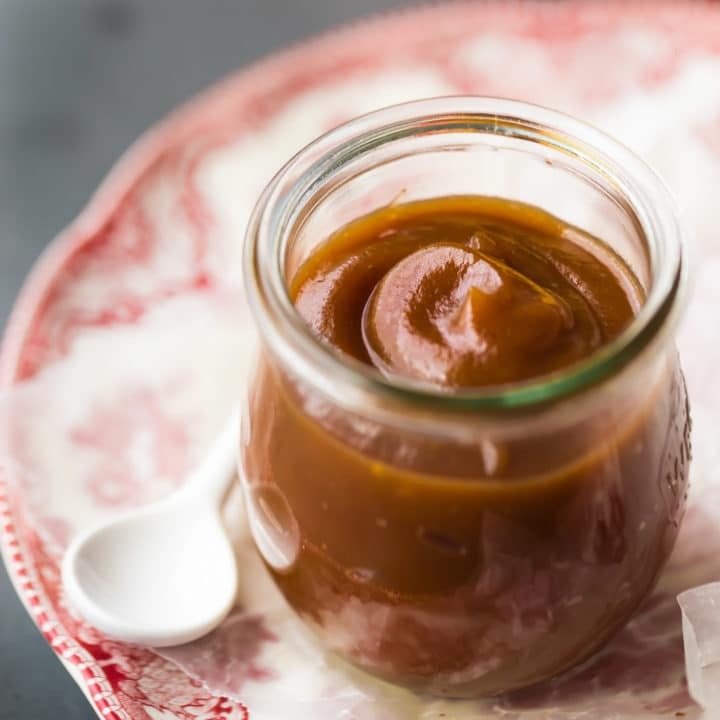 Once opened, a jar of apple butter should last in the fridge for several weeks to a month. Next time you find yourself with an abundance of apples, remember this easy homemade apple butter recipe! And if you have any holiday parties coming up, think about giving jars of apple butter as party favors or a hostess gift! Your friends and family will love the sweet apple and warm cinnamon flavors! Place the apples, apple cider, brown sugar, cinnamon, cloves, and salt in a large pot, and cook over medium-low heat, uncovered, (stirring occasionally) until the apples have become very soft (about 1 hour). Use a hand blender to puree the mixture (or ladle it into a regular blender in batches) until smooth. Place the puree back into the pot and continue to cook, uncovered, (stirring occasionally) until thick, velvety, and deep mahogany brown (about 1 hour). *Apple butter can also be canned. Ladle into sterilized jars, wipe the rims clean, screw on fresh lids and submerge in boiling water for 10 minutes. Processed jars of apple butter will keep at room temperature for several months. Makes about 4 4-ounce jars of apple butter. Oh I am planning on going apple picking and always wanted to make this!! Go for it Samantha! It’s really easy and your kitchen will smell amazing! 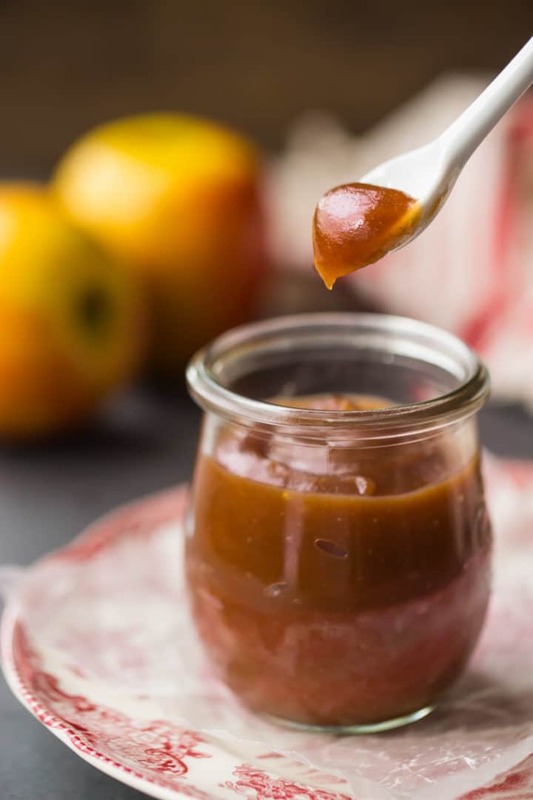 Apple butter was a given at breakfast growing up—especially in the fall! This delicious recipe reminds me of my childhood! I love apple butter! And I love the scent of it baking. Is there anything better? Can I use molasses instead of sugar? Or would it change the process of making the butter? Hi Nancy! I don’t think it would really change the process, but I’ve never tried it so I can’t say for sure how much molasses you will want to add or how long the cook times would be. Definitely worth trying though, it sounds like a delicious idea! Good luck and enjoy! Allie I just made the apple butter and I used molasses and it is absolutely heavenly!!! The house smelled amazing and the outcome is so delicious 😋 It was darker than yours because of the molasses and I used the same measure you used for the brown sugar. Thank you for your wonderful recipes!! Hooray! I’m so glad to hear it Nancy! Thank you so much for letting me know how it all worked out. I’m really excited for you! How have I never had apple butter? This would be SO good on so many things! Does that mean to peel and core the apples THEN weigh out 4 pounds of usable apple??? I think this is pretty specific for anyone who is familiar with reading recipes. When the weight is stated first, and then the prep is stated after, that means the ingredient is first weighed and then prepped (ie: peeled and cored). This is industry standard for all recipes, across the board. Also, the words “about” and “roughly” convey that these are approximations and you can feel free to use your own judgement. Great and easy recipe! I substituted white grape juice for the cider since I had it readily on hand. Thanks for sharing this. My pleasure Rose! I’m so glad you were pleased with the recipe.